Reprinted with permission from A Solitary Torture. Please feel free to repost, reblog & share this information. but may not be republished for commercial purposes. Courtesy of prisoners in a FL geriatric unit. Designed to show the horrific pain of excess soy diet. Washington, DC, June 26, 2012 — Plaintiffs in the lawsuit Harris et al. v. Brown, et al., Case No. 3:07-cv-03225 have submitted testimony of four qualified experts confirming the claim that large amounts of soy in the prison diet can cause serious health problems. In 2004, the state of Illinois began using large amounts of soy in prison menus to save money and use less meat. Sponsored by the Weston A. Price Foundation, a nutrition education non-profit foundation, the lawsuit claims that the soy being fed to the plaintiffs, in the amounts being fed to them, constitutes cruel and unusual punishment in violation of the eighth amendment to the Constitution, as well as a denial of plaintiffs’ liberty in violation of their due process rights under the fourteenth amendment to the Constitution. Toxicologist Mike Fitzpatrick, PhD, provided evidence that even 50 grams of soy can cause thyroid problems, including thyroid cancer. Soy contains compounds called phytoestrogens, which depress thyroid function and cause endocrine disruption. Physician David Brownstein, MD, submitted his opinion that the amount of soy fed to the plaintiffs is, to a reasonable degree of scientific certainty, responsible for causing their health problems, including gastrointestinal distress and bowel dysfunction, vitamin deficiencies (vitamins B12 and D) as well as thyroid disorders. Laboratory analysis expert William Shaw, PhD, noted that soy protein has the highest oxalate level of any known food and that the prisoners are receiving hundreds of milligrams of oxalates per day. According to Shaw, virtually all of the plaintiffs’ health problems can be explained by their high-oxalate diet. The toxicity of oxalates is well established; oxalates can deposit sharp crystals not only in the kidneys, but in virtually every tissue and organ of the body, including joints, heart, blood vessels, teeth, gums, eyes, skin, brain, nerves, thyroid and thymus glands. Oxalates also block the absorption of many essential minerals, leading to malnutrition. The defendants have responded by arguing that the Illinois prisoners receive only minimal amounts of soy protein in their diets. “Presiding judge Harold Baker has stated the importance of scientific and medical testimony in the case,” says Sally Fallon Morell, president of the Weston A. Price Foundation. “We have provided both the science and the medical evidence and look forward to the next steps in this trial. The Weston A. Price Foundation is a 501(c)(3) nutrition education foundation with the mission of disseminating accurate, science-based information on diet and health. Named after nutrition pioneer Weston A. Price, DDS, author of Nutrition and Physical Degeneration, the Washington, DC-based Foundation publishes a quarterly journal for its 14,000 members, supports 572 local chapters worldwide and hosts a yearly international conference. The Foundation phone number is (202) 363-4394, http://www.westonaprice.org,info@westonaprice.org. There is a new trend across America to promote the introduction of more and more soy-based products (made from unfermented soybeans; not to be confused with the Asian use of fermented soybeans) into our diets. Claims are made that soy is a nutritionally sound alternative to everything from milk/ creamer and other dairy products to most meat products such as ground hamburger, hot dogs and pork just to give a few examples. As this trend grows in our supermarkets, so it also grows in popularity in our prisons. Proponents of soy-based products sell it as a cost saving product that lowers fat content in foods. Even foods that are not outright replaced can be stretched and ‘enhanced’ by adding soy to them. Think ground soy-burger ravioli and tacos and you get the idea. What is not being told is very much about the negative side effects that an excess of this refined and unfermented soy in a diet can cause. The refined soy being sold and widely used in the USA is not at all the same as the limited intake of fermented soy products used in Asia. 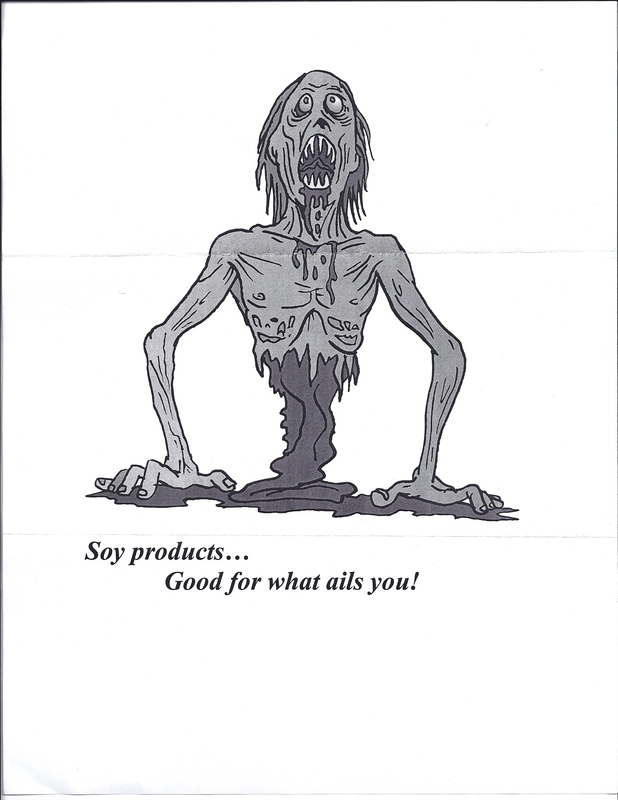 Little mention is made of facts about the neuro-toxin (brain damaging) chemicals that soy beans are first soaked in to be ‘refined’ or that these chemicals attach to the soy and are also being ingested with each serving of soy foods. Unfermented soy products do not have warning labels stating that they are extremely high in estrogen-like chemicals that are damaging to both males and females; that they can cause severe allergic reactions; that they can lead to long term brain damage. Here is a little truth about high-soy protein diets and the health issues that can stem from a steady diet of soy based products and a brief outline of side effects that are common signs of soy allergies and indicators of too high of a soy intake in the diet. ** Soy has an extraordinary amount of estrogen in it – every 100 grams of soy protein you consume has as much estrogen as a high-dose birth control pill. ** Most soybeans are genetically modified, and they contain one of the highest levels of pesticide contamination of all foods. ** Soybeans are very high in phytates (fy-tates), which prevent the absorption of minerals including calcium, magnesium, iron and zinc, all of which are needed in our bodies. Symptoms of iron deficiency symptoms include: fatigue, pallor, hair loss, irritability weakness and brittle or grooved nails. Zinc deficiency symptoms include dandruff, eczema, sleep disorders, white spots under finger nails and light headedness. Signs of severe soy allergy include tingling of your lips, swelling of your airways, breathing complications or rashes after consuming soy products. Anaphylactic shock is an allergic reaction that can be fatal within minutes, either through swelling that shuts off airways or through a dramatic drop in blood pressure. Gastro – intestinal problems, including diarrhea, cramping, excess gas, stomach pains and nausea. Acne and other skin conditions, like eczema. How to recognize soy-filled products? This is extremely difficult to do and something that we here on the outside are helping with. Often times soy proteins are ground up in flour and other dry mixes and there is no way to taste/detect it. We have found information concerning prison food vendors cutting costs and switching to more soy products; when we have more data about which vendors have increased use of soy products, which states and facilities might be effected we will send out the information out to you. In the meantime, obvious forms of soy have been mentioned – more meat with odd texture/taste and sometimes “fillers” such as pieces of corn or grain can be seen. Anything low-fat or light – margarine, creamer or other dressings will be high in soy proteins. If you have access to vending machines on visiting days, beware of snack foods as many are filled with soy ingredients. Over the past two years, the Weston A. Price Foundation has received many letters from prisoners incarcerated in the Illinois Department of Corrections, and also from inmates in other states, concerned about the detrimental health effects of the soy-laden prison diet. As you may know, the case of Harris et al. v. Brown, et al., Case No. 3:07-cv-03225 addresses this very issue. This case is being heard and is currently pending before the Honorable Harold Baker in the United States District Court for the Central District of Illinois. We expect a trial in the latter part of 2011. The case currently has eight plaintiffs. Our hope is to obtain a permanent injunction against serving soy in the prisons, so that in the end all prisoners—not just those involved in the lawsuit–would benefit by getting a soy-free diet. We expect that additional lawsuits will follow after the decision. The right to a nutritionally adequate diet is guaranteed under the United States Constitution/Prison key Law 17: “Obligation of state to provide inmate with healthy environment includes obligation to provide nutritionally adequate food that is prepared and served under conditions which do not present immediate danger to health and well-being of inmates” (U.S. CONST. AMEND. 8” Key Note 8 RamosV. Lamm 639 F.2d 559 (1980). In addition, the United States Supreme Court case of ESTELLE V.GAMBLE mandates adequate medical care. Key Note 6 Prison Key Law 17 states: “Government has the obligation to provide medical care for those whom it is punishing” ESTELLE V GAMBLE, 97 S. Ct. 285 (1976). Under the 1996 Prison Litigation Reform Act, each state prisoner is required to file a grievance and exhaust his grievance procedure all the way through to the end before he can bring an action in the federal court system. In fact, before any lawyer can help you, you must file your grievance, exhaust the grievance procedure and be able to present the proof. There may be prisoners versed in the law who can help you with these procedures. * File a grievance with the Grievance Counselor. Most state laws provide that the counselor has a specified number of days (14 days in Illinois) to give you a written response and return your grievance to you. If you do not get the grievance back in this specified time period, write the Counselor requesting to know why. * The grievance must then be delivered to the grievance officer at the prison’s grievance committee. Again, most state laws provide that the grievance officer has a specified number of days (45 days in Illinois) to respond to your committee grievance. When the grievance officer returns your grievance, it will be signed by the warden and will include a typed-out response and an appeal form on the bottom. On this appeal form is the date the warden signed off on it. * You should then appeal the warden’s decision to the Administrative Review Board for your state. If you do not send your appeal of the warden’s decision in the mail in the required time limit (30 days in Illinois), you have procedurally defaulted and cannot bring action in court as a state prisoner. DO NOT MISS THIS DEADLINE OF APPEALING THE WARDEN’S DECISION TO THE STATE REVIEW BOARD. You have a legal deadline here, as this is the 14th Amendment, and the 1st Amendment right to access the courts under the 1996 Prison Litigation Reform Act. * Before submitting your appeal to the Administrative Review Board, make two copies of your grievance and the replies submitted by the counselor, the grievance office and the warden. Keep one with you and send one to a family member or friend for safe keeping. This is important because the facility in which you are incarcerated has a habit of “losing” your grievance. * Mail the grievance (as legal mail) to the Administrative Review Board (ARB). The address for the ARB in Illinois is P.O. Box 19277, Springfield, Illinois 62794-9277. The ARB has 6 months to respond with an answer to your grievance. * When you receive their response, again make two copies. Keep one with you and send one to a friend or family member for safe keeping. 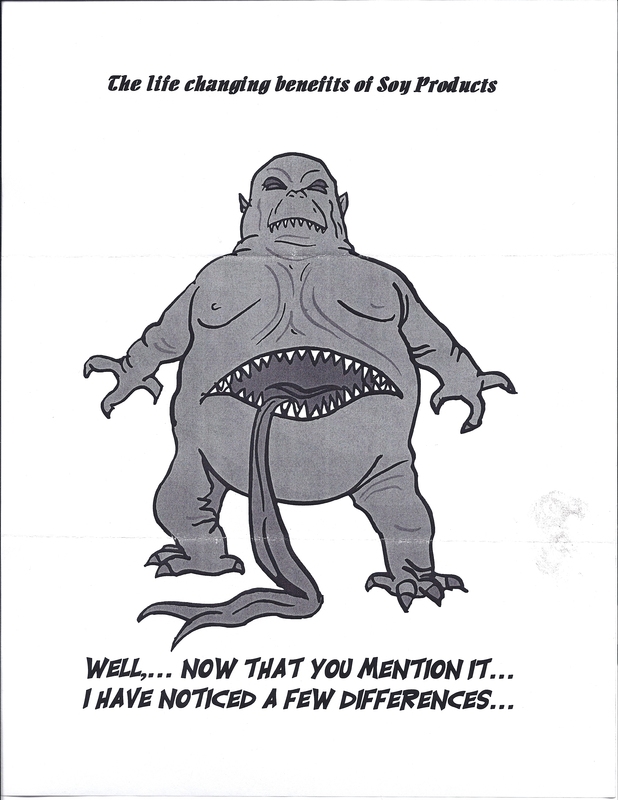 Attach a copy of the ARB’s written response to your copy of your grievance. You will need these papers for any civil action you file. First, you need to specify the facts that have resulted in a deprivation of your right to adequate medical treatment. These facts must be specific to the person(s) involved, the dates, the times, the locations, and the specific conduct that you are grieving. Second, you need to state how you were harmed by the specified conduct. Were you denied adequate medical treatment? Were you denied your ability to speak? Were you denied nourishing food? Are you experiencing pain or discomfort? Where? How often? Be as specific as possible with the type of harm that you have suffered from the conduct that you are grieving. Third, specify the type of relief that you want. Do you want medications? Do you want more medical treatment? Do you want a specific type of food (such as a non-soy diet)? Specify what you want to make the grieving conduct stop. You are protected against retaliation for filing a grievance by the 14th Amendment of the United State Constitution under due process of the law. Some people are affected more quickly than others by the soy diet. Soy protein damages the thyroid gland, located in your neck. Your thyroid supplies the chemical signals to your liver and other digestive organs that make your body work right. A lot of prisoners suffer from a disease caused by eating soy. It is called hypothyroidism, and is easily detected by a blood test. Symptoms of hypothyroidism include weight gain, brain fog and fatigue. If you suspect that you have thyroid disease due to the soy-based diet, request to have your thyroid hormone levels checked. You should request a test called a thyroid panel which measures the levels of three hormones in your blood: TSH, T-4, and T-3. If your TSH (Thyroid Stimulating Hormone) values are above 4.2, you need a soy-free diet and medical care to correct your bodily functions. Thyroid hormone treatment is required by taking a pill every day and not eating soy, as soy causes the disease. 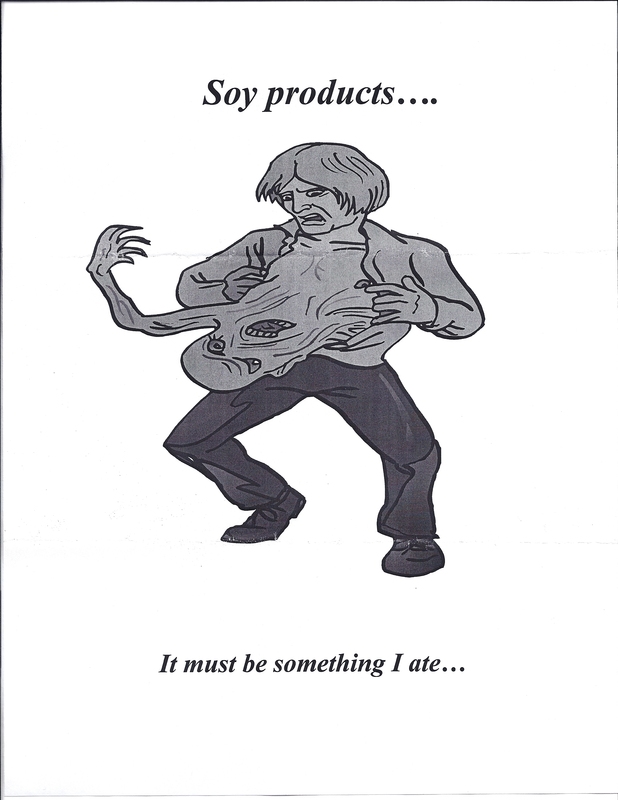 Eating soy will make the disease worse, especially if you are forced to eat it every day. Request to buy a copy of your test results. This is your right. Be sure to make two copies of the test results. Keep one for yourself and send one to a family member or friend for safe keeping. If you have a TSH value of over 4.2, you should request a soy-free diet for medical reasons. If you are not given a soy-free diet, you should file another grievance, following the procedures outlined above. Even if you do not have abnormal TSH values, the State is required by law to provide you with a diet to sustain your health. However, it is vital to keep records of all your grievances, committee responses and medical records. You should also keep a personal log of your medical problems. If you have carried out the grievance process described above without results, please send copies of all your records to the Weston A. Price Foundation. Remember, without AN EXHAUSTED GRIEVANCE, no attorney can help you while you are in prison. Once you are out of prison, you do not have to follow the Prison Litigation Reform Act rules. You will have two years to file a lawsuit. Again, it is very important to keep copies of all of your grievances and medical records. If possible, have your loved ones send you enough money to purchase commissary foods. Use your commissary money wisely to purchase healthy foods. Good choices include sardines, tuna, salmon, cheese, summer sausage, Spam (for vitamin D and healthy fats), beef, pork cracklings and plain rice. Avoid sweets, chips, sodas, etc. as these make you more vulnerable to the harmful effects of soy. pizza toppings, chili, meat sauces, burgers/patties. breaded patties, shapes, rolls and loaves. Soy Products Used Isolated soy protein is designed to replace a portion of salt-soluble meat proteins, bind fat and water, stabilize emulsions and ensure cohesiveness in finished cooked products. Soy protein concentrates contain a high concentration of protein providing dispersibility, solubility and emulsion properties. Both isolated soy protein and soy protein concentrate are designed to improve texture and provide a juicy and meaty mouth-feel. Soy flour and grits are used to retain moisture and reduce cost. Textured soy flour is used to develop textures and can be flavored depending on the application. *Ultra-Soy QR800C(F) is a product of PMS Foods, Inc.
1. Add 6.88% water to the textured soy flour. Let stand 10 minutes. 3. Add onions and garlic powder. Cook for 5 minutes. 4. Add tomato paste, catsup, remaining water, vinegar, dry mustard, pepper and brown sugar. Mix well and simmer for 25 to 30 minutes. 5. Portion with #12 scoop (1/3 cup). *Response 4400 and Promine DSP are products of Central Soy Company, Inc.
1. Double grind skin through 1/8″ plate. Grind breast meat through 1/4″ to 3/8″ plate. 2. Prehydrate textured soy protein concentrate with about 3/4 of water amount. 3. Blend breast meat with phosphate, salt and a portion of the remaining water. 4. Add functional soy protein concentrate, remaining water, ground skin and seasoning. Mix until uniform. 5. Add hydrated textured soy protein concentrate and blend until uniform. 6. Batter, bread, flash fry and cook. SOURCE: Central Soy Company, Inc.
Senior scientists in the United States, who have studied glyphosate and glyphosate-tolerant GM crops for decades, identified more than 40 diseases linked to glyphosate, and the list is growing. They call it “mad soy disease” in Brazil, where it has been spreading from the north, causing yield losses of up to 40 percent, most notably in the states of Mato Grosso, Tocantins and Goias. Like its namesake, mad cow disease, it is incurable. This is the latest GMO fiasco to surface since our report on the meltdown in the USA (GM Crops Facing Meltdown in the USA, Science in Society Issue #46), China (GM-Spin Meltdown in China, SiS Issue #47), and Argentina (Argentina’s Roundup Human Tragedy, SiS Issue #48). Mad soy disease has afflicted soybeans sporadically in the hot northern regions of Brazil in the past years, but is now spreading to more temperate regions in the south “with increased prevalence overall”, according to a US Department of Agriculture scientist. The disease delays the maturation of infected plants indefinitely; the plants remain green until they eventually rot in the field. The top leaves thin out, and the stems thicken and become deformed. The leaves also darken compared to healthy plants; the pods, when formed, are abnormal with fewer beans. Researchers have yet to find a cure for the disease, as they are still not sure what causes it. The prime suspect for spreading disease is the black mite found in stubble when soybean is grown in no-till production systems. According to the USDA Global Agricultural Information Network, Brazil has 24 million acres planted to soybean, 78 percent of which are GM. Apart from mad soy disease; Brazil’s soybean is simultaneously afflicted by soybean Asian rust that first appeared in 2001-2002. Producer groups are requesting the Brazilian Government Agency to speed up approval of more effective fungicide to combat the disease, which would have significant cost implications. But for mad soy disease, no cure is forthcoming. Mato Grosso, which alone produces nearly 30 percent of Brazil’s soybean crop, is among the states that have brought the issue of mad soy disease “to the forefront”. Disease of GM soybean is no longer a surprise. Senior scientists in the United States, who have studied glyphosate and glyphosate-tolerant GM crops for decades, identified more than 40 diseases linked to glyphosate, and the list is growing (Scientists Reveal Glyphosate Poisons Crops and Soil, SiS #47). Glyphosate tolerant crops play a pivotal role in causing and spreading diseases, not only to the crops themselves, but also to other crops grown nearby or planted subsequently (Glyphosate Tolerant Crops Bring Diseases and Death, SiS #47). 5. Saunders PT and Ho MW. From the Editors: GM spin meltdown in China. Science in Society 47, 2-3, 2010. 6. Robinson C. Argentina’s Roundup human tragedy. Science in Society 48 (to appear). 7. Ho MW. Scientists reveal glyphosate poisons crops and soil. GM meltdown continues. Science in Society 47, 10-11, 2010. 8. Ho MW. Glyphosate tolerant crops bring diseases and death. Science in Society 47, 12-15, 2010. NYTimes – “Florida prisons serve meals with 50 percent soy and 50 percent poultry three times a day, a mixture that costs half as much as using beef and pork, the Department of Corrections says. The cost per meal: $1.70 a day for each inmate. Florida prisons first began serving soy-based meals in 2009. As an inmate at the Lake Correctional Institution, near Orlando, Mr. Harris, a former paralegal, has few culinary choices. He can eat 100 grams of soy protein a day, use his own money to buy food at the commissary or eat a vegan diet, he said in the lawsuit, which was filed in state court in Tallahassee and which The Orlando Sentinel reported onthis week. Gretl Plessinger, a spokeswoman for the Florida Department of Corrections, said inmates can choose an alternative vegan meal if they do not want soy. “We have a constitutional obligation to feed them healthy, nutritious food, but we don’t have an obligation to feed them beef,” she said. It turns out that Mr. Harris is not alone in his objection. Nine inmates at the Danville Correctional Center in Illinois filed a similar lawsuit there in 2009, which is pending. That lawsuit is being financed by the Price Foundation. Prisoners who have soy allergies or other ailments are especially at risk, said Ms. Fallon Morell, who added that her organization has received hundreds of calls from inmates and their relatives in Illinois and Florida who complain about the ill effects from too much soy. Illinois switched to soy-based meals in 2004 to save money. I believe it must be noted that this discussion is about non fermented soy products which poses the problem and health threat. That is what they are serving inmates and that is the problem. Fermented soy has been used by the Asian culture for thousands of years. Asian people will not eat non fermented soy.